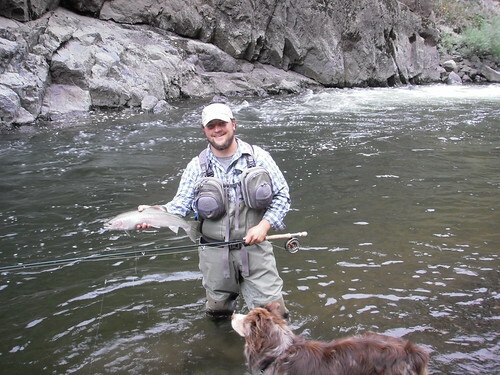 I spent two days the other weekend fishing the lower five miles of the Imnaha. It was a rainy two days on the river. Saturday it went from light rain to heavy down pours to fifteen minutes of sunshine a couple times. But the fishing was good. Rain usually means good steelhead fishing in the fall. It seems to trigger something in them to move upriver and when they are on the move, it also seems that they are on the bite. I typically fish a three fly rig. I will fish either a double bunny or olive woolly bugger as my top fly. For my second fly I usually use a nymph whether it is a copper john, prince nymph, or a stonefly nymph and then for my final fly I will either fish a second nymph or a single egg pattern. Egg patterns are highly successful patterns, but I seem to do better with nymphs early in the year. It seems that somewhere around the end of October or the first of November, egg patterns start to catch more steelhead. The streamer, whether it is a double bunny style of fly or a woolly bugger, won’t catch steelhead every day of the week. There are some days when I only catch the steelhead on the nymph and egg patterns. But there are other days when they really want to destroy a streamer. I have had some days of steelhead fishing when I caught all of my steelhead on a streamer, but more often than not it is a mix. This past rainy weekend the streamer was on though. I did not catch all of my steelhead on it, but I caught at least fifty percent of them on it. One of the nice things about fly fishing is meeting people along the way. A few weekends ago as I was landing a steelhead on the Imnaha, Cody with his dog Blue, walked up and began talking to me. We saw each other a few more times that afternoon fishing and I finally told him he might as well fish with me rather than just watching me fish. That evening as I was preparing my freeze-dried meal Cody offered me a steak, fried potatoes, and a cold beer. Well, there is no better way to make friends with me than that. After an evening of eating his food, drinking his beer, and talking about all things related to fly fishing and fly tying I felt a little bad for not having any good food or cold beer to repay him. So after fishing together again the next day I offered to drive the rough Dug Bar Road to Imnaha to buy a burger and beer at the Imnaha store and tavern. It is a long drive, but I had been thinking about burgers and beer most of the afternoon. After the rough and bumpy hour long drive back to Imnaha, the store was closed. There was no sign explaining why or anything else. Just a closed sign. Well we had already drove the hard part so I decided another thirty miles to Joseph was easy. And it was worth it. Although that was definitely the longest drive I have ever made for a burger and beer. This past weekend I met up with Cody again on the Imnaha. Apparently he is used to fishing for steelhead on the Clearwater and the catch rate is a little slower over there. At any rate, I was able to enjoy Cody’s company again along with Will, not a dog this time, but a friend of Cody’s. I am going to have to start bringing better food though. Will and Cody had much better food than me once again and shared it with me. After a day of fishing and hiking along the Imnaha when I am by myself, I am pretty content with something warm for dinner, a little bit of reading, and then going to sleep early. Cody and Will’s much better food and company were a definite plus. Thanks, it is good to know. It was kind of weird. It had been open everytime I went by and then all of a sudden the doors were locked with no reason why.